The kitchen sink, with its plentiful hot and cold running water, is a mundane feature of our daily lives that we take for granted—unless, that is, the water dries up or turns smelly, thereby inconveniencing our schedules or threatening our health, or unless we are considering a house purchase or renovation.The tap turns on, the water obligingly pours out; the tap turns off, the water obligingly drains away. In Situ. 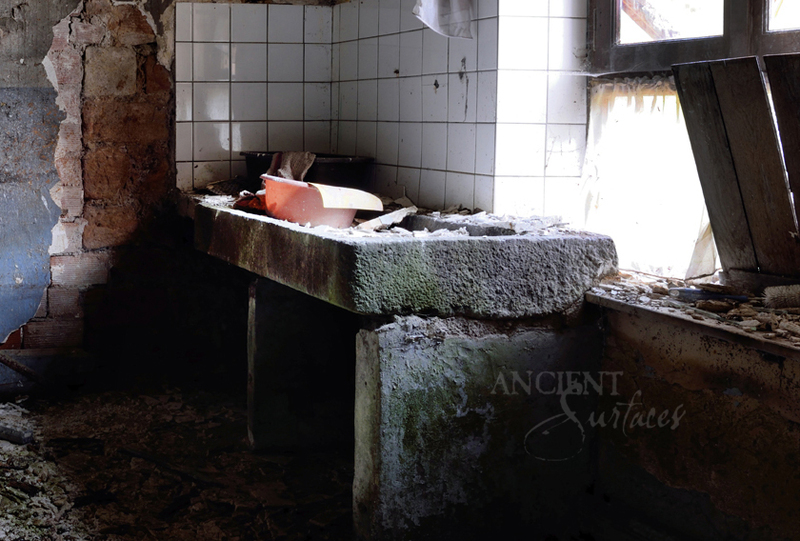 An old stone sink as seen in an ruined French farmhouse in Provence. Of course it was not always so. 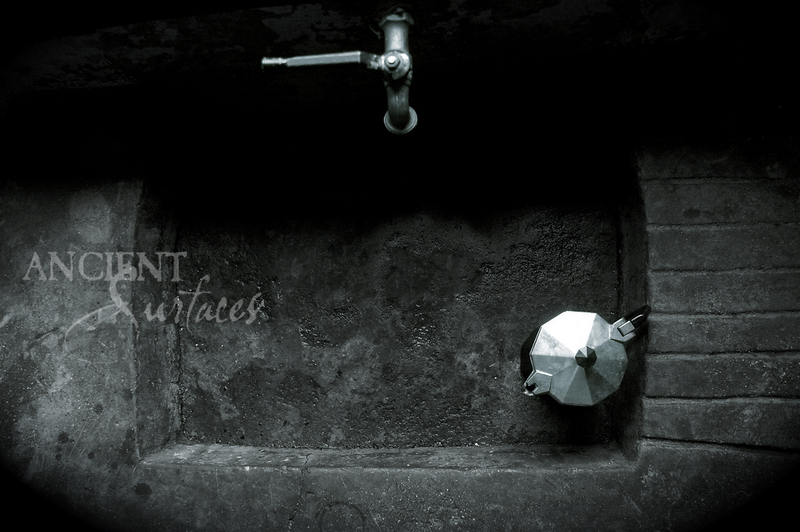 The advancement of kitchen sinks from dishpans filled with buckets of water to today’s carefully controlled municipal system—with its in/out pipes, hot water tanks, and on/off taps—reflects developments in plumbing technology, society’s evolving concerns about civic and moral health, and major alterations in expectations around women’s work. 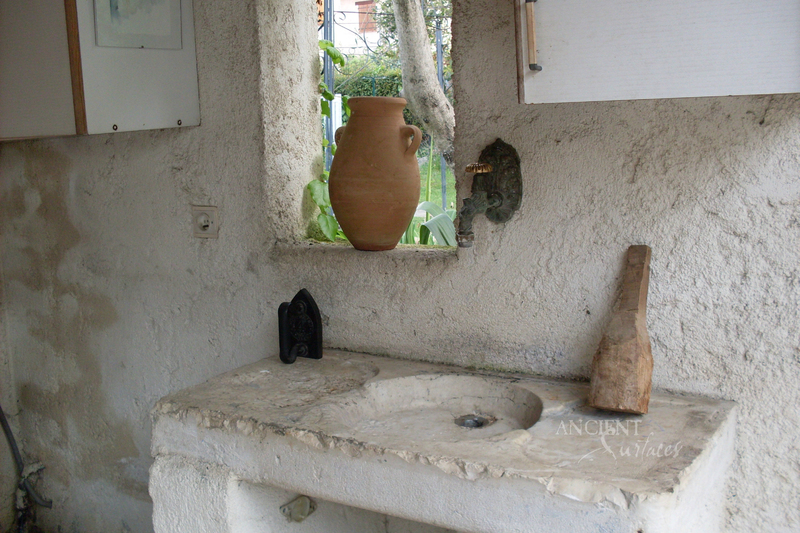 A real, centuries old limestone sink. Hand carved out of a full block of stone. Farmhouses usually had the sink in the big room that doubled as central family space and kitchen, rather than in a separate scullery. 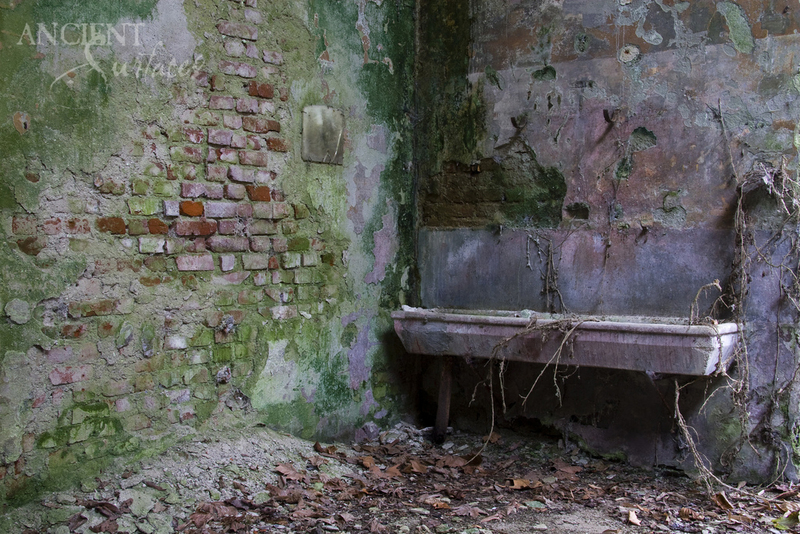 But estate houses and houses of any pretension had a separate room, either called a sink room or scullery, for washing up and vegetable preparation. 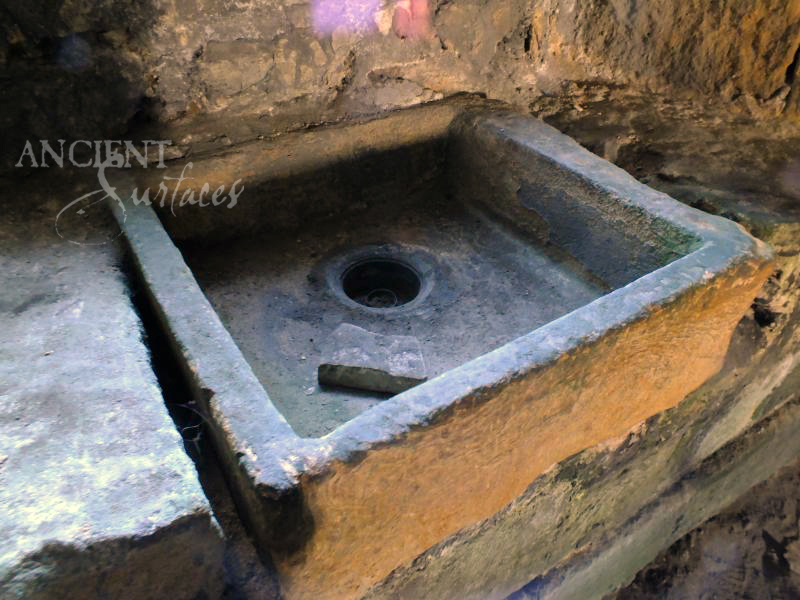 An elongated, trough like, vegetable washing and preparation sink seen in a ruined Provence countryside castle from the 16th century. 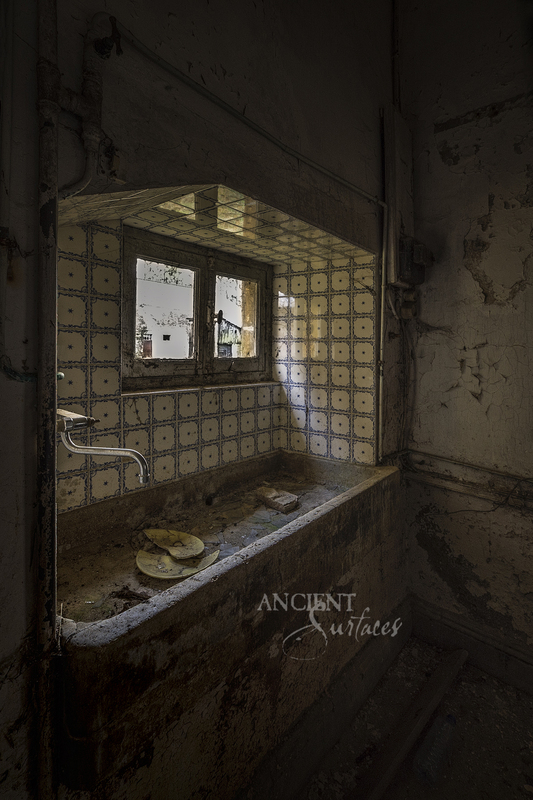 Such properties also often had a space off the dining room called a butler’s pantry that contained a sink reserved for washing fine china, silverware, and glassware. 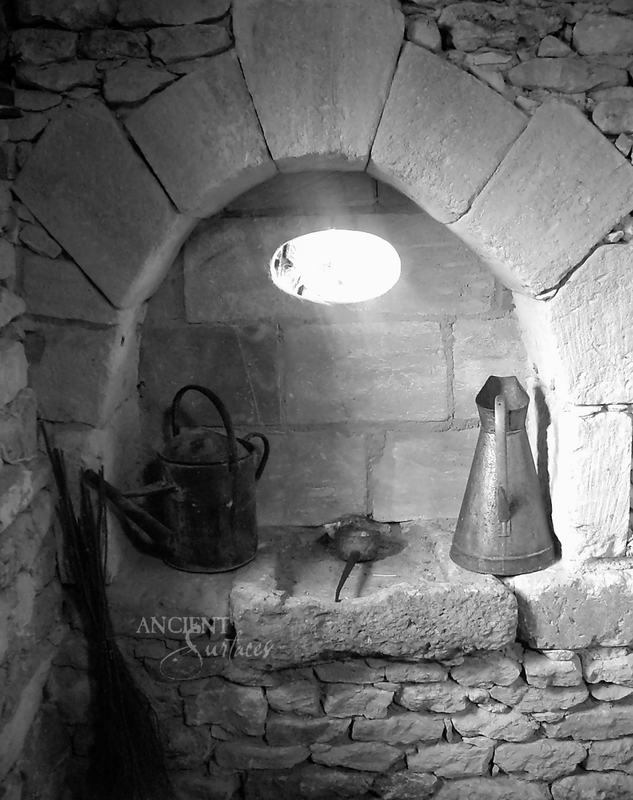 Examples of butler’s pantries are still seen today at museum farmhouses and castles all across Europe. 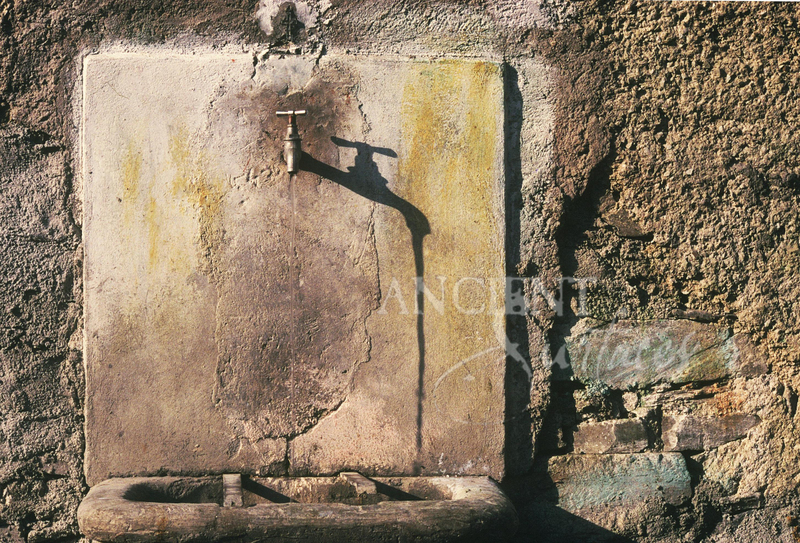 Another rectangular, trough-like, washbasin kitchen sink, hand caved for an Italian Tuscan villa from the turn of the 15th century. 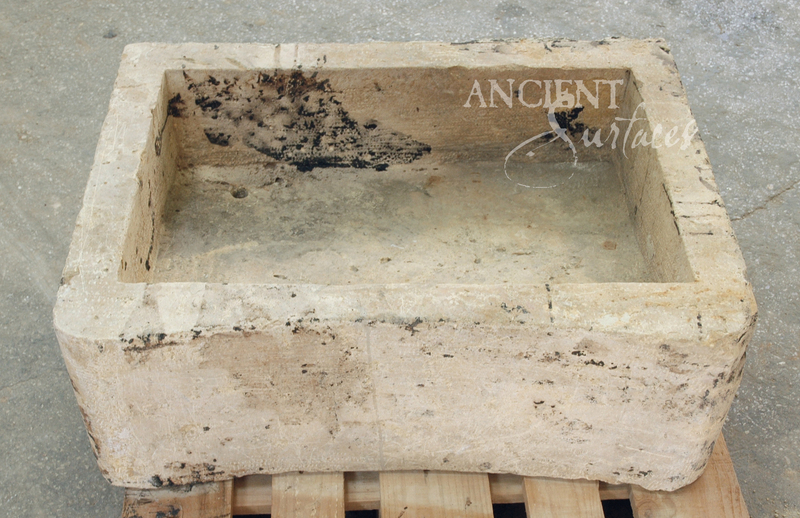 A massive antique thick slab sink seen with three supportive limestone legs. Sinks could finally be built by the hundreds, even the thousands and at a marginal cost. No time-honored hand carving was needed any longer. 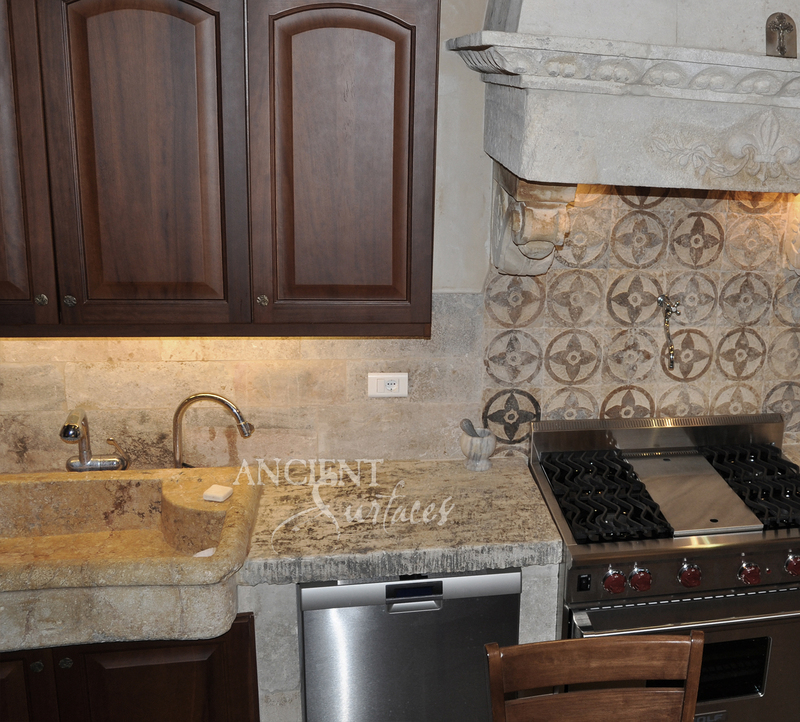 Kitchen cabinets were now standardized and built in production facilities, prompting the use of counter tops with integral sinks. 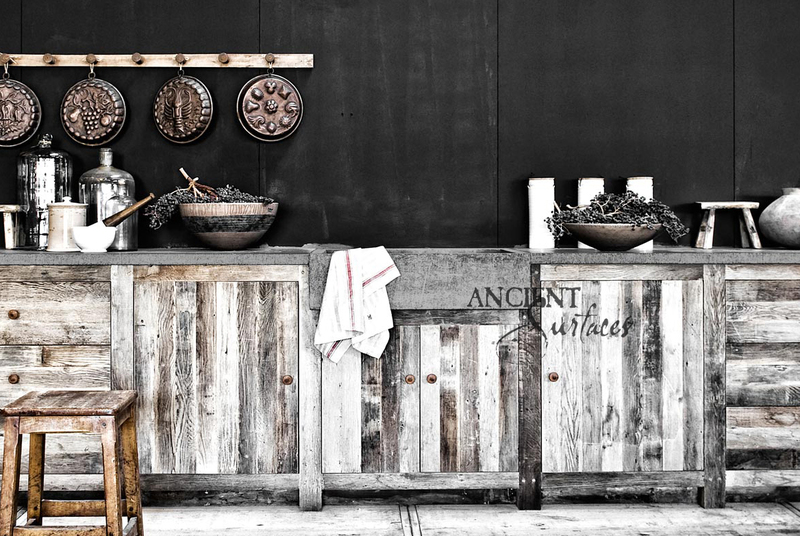 A still working 400 years old outdoor potato washing sink in Provence France. So, what is wrong with that you ask? First off, those uniformed kitchen cabinets were perfect for a select group of people; those who measured 5’5” to 5’10” in height. 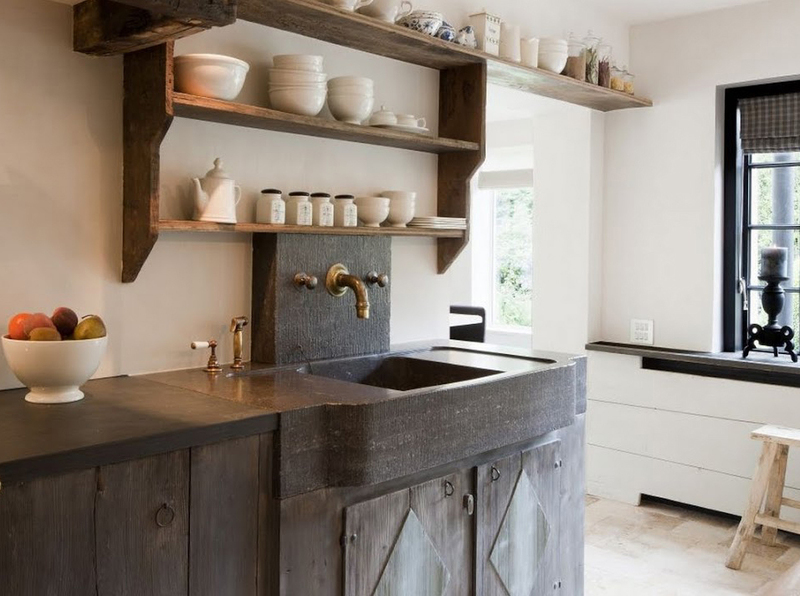 Secondly, sinks that were installed in a counter top required a significant amount of counter top space in front of and behind the sink to account for the mechanical stability of the counter top. 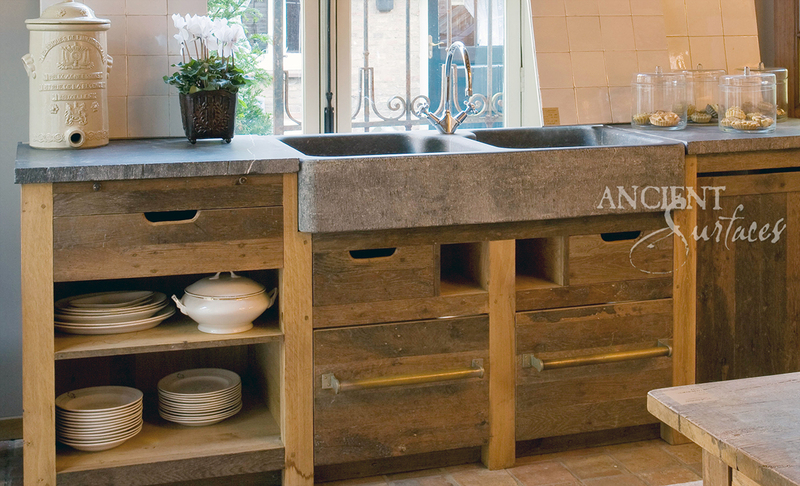 A stone block with a shallow sink cut used as a hand sink in an old Tuscan farmhouse. This required that the sink recede, away from the user, causing the user to bend needlessly at the waist. Moreover, metal was a very expensive product during this phase of our early 20th century history when production line was introduced. 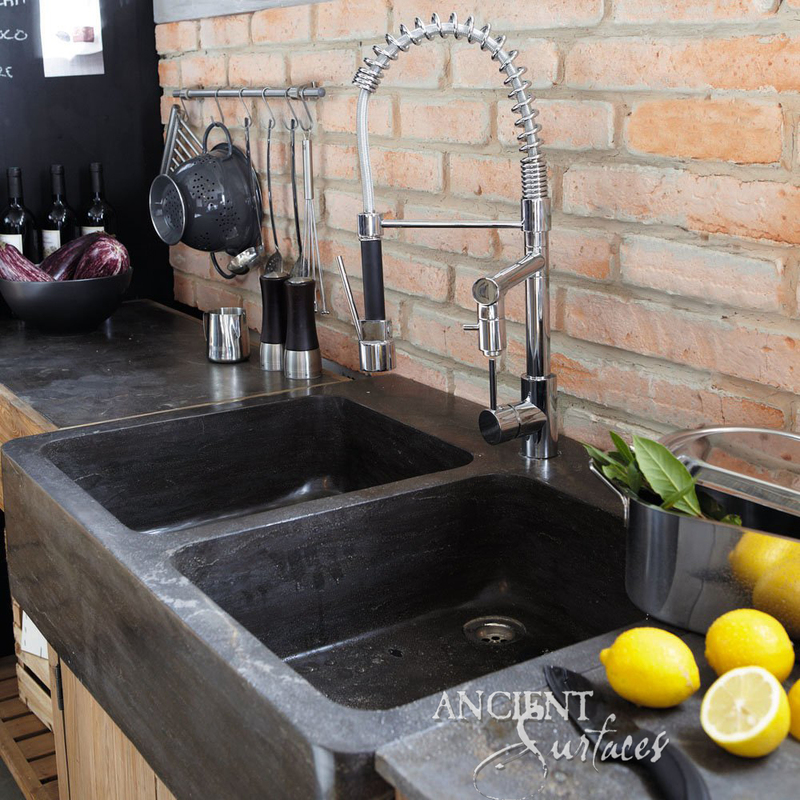 Hence metal sinks were shallow in depth, to save on cost. This was ideal for some, but not nearly as efficient as the deeper stone sinks of times past. 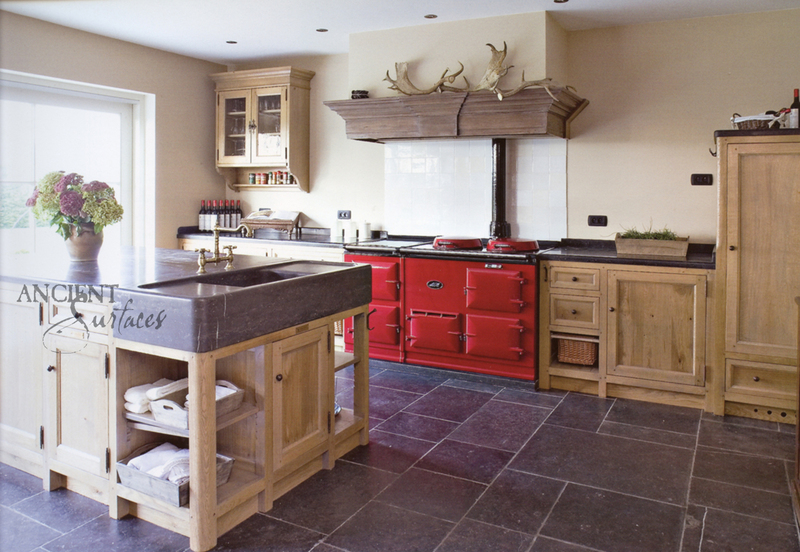 Times have once again changed and it seems that our generation it completing the full cycle of the kitchen sinks, shying away more and more from 21st century production line metal, enamel and ceramic sinks back to real limestone and marble that are simply unrivaled in charm, history and beauty. 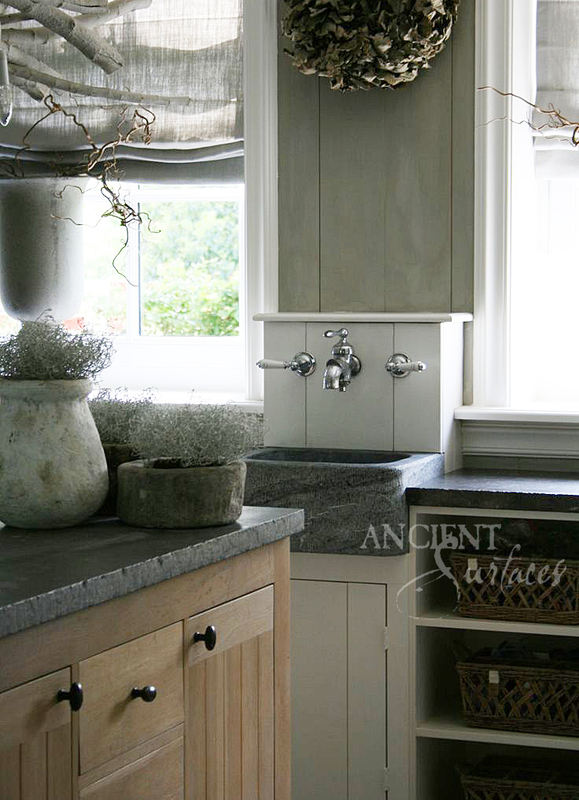 A similar antique sink to the earlier one, installed recently in a Bastide style home.